Another new year, another CES for the books. I am blessed every year to experience a cool CES, whether I'm opening for Lady Gaga at Polaroid, as I have in the past, or sharing my top tech picks during fun live gadget segments on CBS and CNN, every year at CES brings its own nerdy memories. This year, I was covering the show floor for both ESPN and Spike, which meant the usual endless scouring for the hottest gadgets in 2013. Here are my thoughts on a few things that stood out, and a few that didn't. Hand's down, my favorite display was LG's "World's First 3D VideoWall." Its brilliance and size can best be summed up in pictures (below). There may or may not have been an astronomy scene playing out in the most beautiful 3D palette (using Ray-ban like passive glasses that, themselves, were cool) that I'm pretty sure I cried. We've come a long way since staring in awe at Microsoft's early 90's screensavers. I regained composure when a nerd ran over my foot for the 80th time with rolling luggage. WTF is in those things anyway?! One way to stand out in a sea of 20,000 products is to be outrageous. Enter the intelligent fork. HAPILABS' HAPIfork monitors how fast you eat your food, and will vibrate and shine an LED light when you are eating too fast. (The fork is programmed with a recommended "pace" to encourage you to eat "fork servings" more slowly). 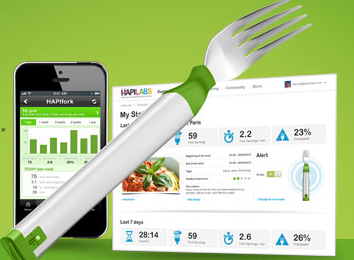 Due out in 2013 and avails for pre-order, HAPIfork will launch with an eating "coaching program" app for iOS, Android and Windows. Wait, what? Meet Dr. 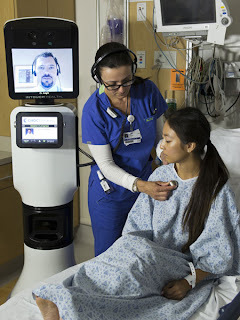 Robot, aka RP-Vita, a revolutionary device made by iRobot in collaboration with inTouch Health, which could save lives. RP-Vita is a new telepresence robot that works to connect medical professionals to areas in need, while also compiling and sharing patient data to help expedite patient diagnoses and consultations. It's something that will be especially useful in underserved and rural areas, and you can expect to see this robot moving autonomously into hospitals in the next few months. Here's how it works: A woman has a what appears to be a stroke and immediate diagnosis is needed. RP-Vita links up to a doctor remotely, who appears on the robot's screen (where its face would be, if it had a face). Controlling the robot from his iPad, the doctor has access to two cameras, and can examine the patient with wide-angle and close-up lenses, making a fast diagnosis, even if that doctor is physically located hundreds of miles away. Once its work is done, the robot, which runs on a lithium ion battery, docks itself for charging. Want to know more? RP-Vita will also be making an appearance on a segment I am working on for the Today Show this Friday. The new lineup of HMDX Jam wireless portable speaker is coming, and audiophiles can look forward to new styles and a rugged version. FTW! 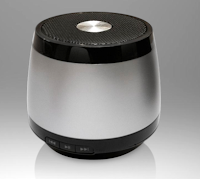 This little wireless speaker was my holiday pick for just about everyone--friends, family, co-workers, TV segments and other miscellaneous people I kinda-sorta like. The current version of speakers sells for around $40, but considering the quality of the output, you'd think it was at least a $150 speaker. Excited for the next gens! The buzz words and unofficial themes of this year's CES were undeniably "4k" and "Ultra HD." Pop those terms in a CES drinking game, and good luck (watch out for the rolling luggage!) Just about every TV manufacturer was touting its latest lineup of smart TVs and higher resolution screens. It's easy to get caught up in the specs, but all you need to know about 4k is it has four times the resolution of your 1080p TV. An LG rep summed it up best when he likened the difference to seeing spots on a leopard vs. seeing the actual skin of a leopard. Each brand had its own distinct smarter features. Panasonic has a voice-to-TV feature that allows you to tell the TV commands with a special remote, so if you say, "Search the web for All Access Weekly," it will go directly to the Internet. And LG was touting its new NFC technology, which allows you to share or send content from your smartphone to your TV. With sore feet and nerdy memories, I head from Sin City to the City That Never Sleeps with boatloads of gadgets and excitement for Saturday, since it will be the first day of fewer CES emails. Hooray! 3.) 4K technology could be the future of TV? 4.) Will Consumers Go For New Smartphones? 5.) Could X2's Skin Patch Detect Concussions? For now, I say, "chowski!" How drunk did you get with the drinking game? Hey, is that Psy standing near you with the pink polka dot in the 3rd picture?